Jim Shaw, EVP of Engineering at Crystal Group, discusses rugged embedded computing, and it’s relevance in the market. Hi, Jim Shaw here again at Crystal Group. 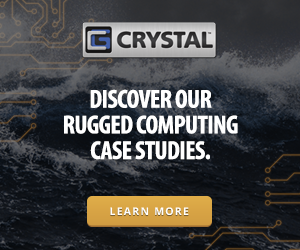 I wanted to talk about embedded computing, and what that means to us here at Crystal Group. An embedded computer is typically more of a workstation class computer. It doesn’t have as much memory, it doesn’t have as much compute capability, and it doesn’t have dual CPU’s, or things like that. What it does have is that it is typically more power efficient, it is much more compact, and it is also specifically built for an end use. For us embedded is essentially specifically designed for something, and that is generally the definition in the industry; although were able to take and create an embedded product that is relatively modular while still being purpose built. We can do things like add drive bays underneath the assembly, or add video cards, or things like that. We put a little bit of a twist in terms of the embedded capability as well as being modular too.